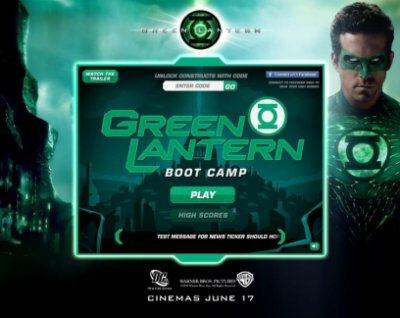 To celebrate the release of Warner Bros. Pictures’ "Green Lantern" in UK cinemas on 17 June 2011, budding intergalactic superheroes can train and prove their worth in cyberspace at Green Lantern Boot Camp, an exclusive Flash game at www.greenlanternbootcamp.com. Bringing the enduringly popular superhero to the big screen for the first time, “Green Lantern” stars Ryan Reynolds (“X-Men Origins: Wolverine”) in the title role of Hal Jordan and Blake Lively (“The Town,” TV’s “Gossip Girl”) as the spirited Carol Ferris, under the direction of Martin Campbell (“Casino Royale”). In a universe as vast as it is mysterious, a small but powerful force has existed for centuries. Protectors of peace and justice, they are known as the Green Lantern Corps. Each member of this brotherhood of warriors sworn to keep intergalactic order wears a ring that grants him superpowers. But when a new enemy called Parallax threatens to destroy the balance of power in the Universe, their fate and the fate of Earth lie in the hands of their newest recruit, Hal Jordan, a gifted and cocky test pilot and the first human ever selected to be a Green Lantern. Now superhero fans are being given the exclusive opportunity to become a protector of the galaxy by making their way through Green Lantern Boot Camp, where they can build their own constructs out of pure green willpower and send them into battle. A tank against an angry swan! A swarm of bees against an enemy squid! Anything is possible online at Green Lantern Boot Camp. Martin Campbell directs “Green Lantern” from a screenplay by Greg Berlanti & Michael Green & Marc Guggenheim and Michael Goldenberg, from a story by Greg Berlanti & Michael Green & Marc Guggenheim, based upon characters appearing in comic books published by DC Comics. The film is being produced by Donald De Line and Greg Berlanti. Herbert W. Gains and Andrew Haas serve as executive producers. Geoff Johns and Lucienne Papon are co-producing. “Green Lantern” will be distributed worldwide in 3D and 2D by Warner Bros. Pictures, a Warner Bros. Entertainment Company. Would you raise a chimp as human?